I remember being at home one day and I called my parents house to talk to my mom like I usually did. My mom had been having side pains for about a week, and she was in an out of the urgent care, without a real answer. My dad said that my mom was at the hospital and that they had given her a room. I’m not talking about a emergency care room, she was upstairs in the critical care area. She was having test done, and the Dr. found e-coli. The infection had already spread into the liver, kidneys and the lungs. The deadly strand of bacteria was from a sandwich she had eaten three weeks before. In the hospital, her immune system was becoming weaker. She had a major surgery in her lungs and she was recovering well. She had already been in the hospital for about three weeks and was on her way to recovery. My family was excited that she was coming home in a few days. Then, the nurse came in with the bad news. My mom had MRSA, and her stay was extended for another week. She was moved into another room, and we were not allowed in there without a full body suit and a mask. MRSA is Methicillin-Resistant Staphylococcus Aureus, and it is a type of staph bacteria. This type of staph bacteria cannot be treated with your common treatment for staph infections. MRSA enter a person's body through a cut, sore, catheter, or breathing tube, and causes infections. My mother, before and after her surgery was on a catheter and a breathing tube. This type of infections, are common in people with weak immune systems. Many of these types of infections linger around hospitals waiting to strike. Antibiotics used to cure common staph bacteria are oxacillin, penicillin, and amoxicillin, but many people that are prone to these types of infections have become resistant to these medications. MRSA is also resistant to these common antibiotics. 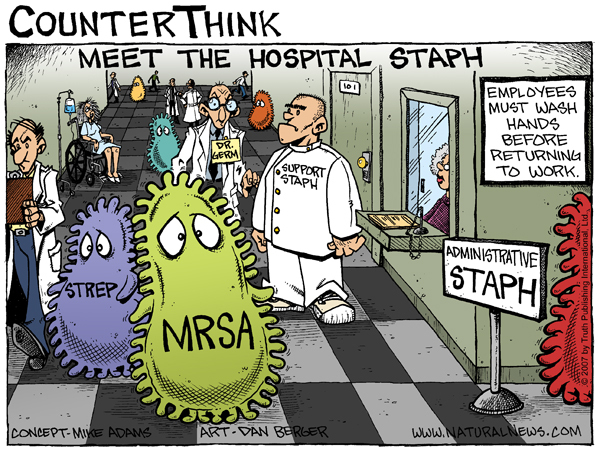 MRSA infections are common in a hospital like setting, and most of these infections are on the skin. This infection is also common among atheletes, and people that share personal items or equipment. Staph infections can result with redness, swelling, abscesses and boils on the skin. They can also be painful. MRSA also causes flu-like symptoms such as fevers, fatigue, shortness of breath and muscle aches. Worsen symptoms include chest pains, joint pains, painful breathing, fevers and chills. It can cause low blood pressure if the bacteria enters the blood stream. The infection my mom had was located in her lungs. The bacteria entered her body from the hospital setting into the open wounds from her surgery. Today, my mom is doing great. Its been about 3 years since this incident. MRSA can be a scary infection to contract and I have become more of aware of bacterias such as this one.